Surfing and Stand Up Paddle are the favored activities on these waters, where thousands of people each year get up on a board to ride a wave for the first time in their lives. This is the coolest microdestination in the Riviera Nayarit thanks to its colorful, cosmopolitan, hippie chic style, so very inclusive and full of life. It was thanks to these unique qualities that it received the designation of Pueblo Mágico (Magical Village) on behalf of the Federal Government. If you come to Sayulita you’re going to have to leave your diet behind, because you won’t want to miss out on the local cuisine. The most interesting meal has to be the chocobanas at the Chocobana Breakfast and the frozen fruit treats and tropical fruit drinks at Wakika are refreshing, but if you’re looking for something elegant in the dinner department, head to Don Pedros, right on the beachfront. Paninos is the place to go for the tastiest bread and you can find a great bottle of wine at the Sayulita Wine Shop. Oh, and don’t forget the shrimp tacos! The good thing is, you can burn off the calories by renting an SUP board at Stand Up Paddle Mexico or a surfboard at Luna Azul Surf and taking a class. 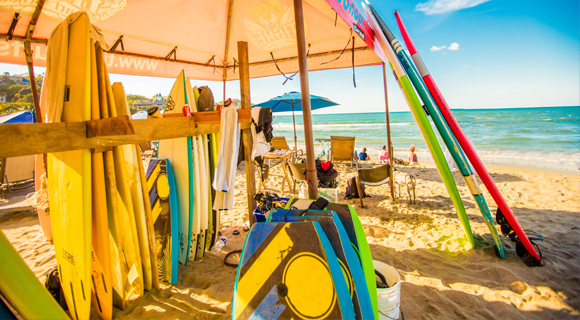 By the way, did you know the very best SUP surfers in Mexico are from around here? And as for accommodations, you’ll find awesome villas and small hotels in the mountains, although camping out for a night (or several) is a total hit. Here the local artists will surprise you with their unique creations, where they mix the traditional with the contemporary. Musts include shopping at Esto Es México and Revolución del Sueño. Or, if you’re looking for some amazing Huichol traditional art, you’ll find the best at the Galería Tanana. This is the most happening beach village in all of the Riviera Nayarit. The electrocumbia on Fridays at El Camarón is off the hook. And the bar at Don Pato across from the main plaza is tops for live music… And there’s more!